PA-style! Yes, that is an outhouse in Delia’s backyard, and no, we didn’t spend the day in those chairs looking at it. The marsh behind it had more wood ducks than I’ve seen in my life, plus pintails and newly arrived tree swallows. There were even peepers peeping this morning. A great day… more pics tomorrow. to Happy Valley PA… Susan and I are here in State College to attend Delia and Kat’s commitment ceremony and do a bit of marsh birding in the morning. 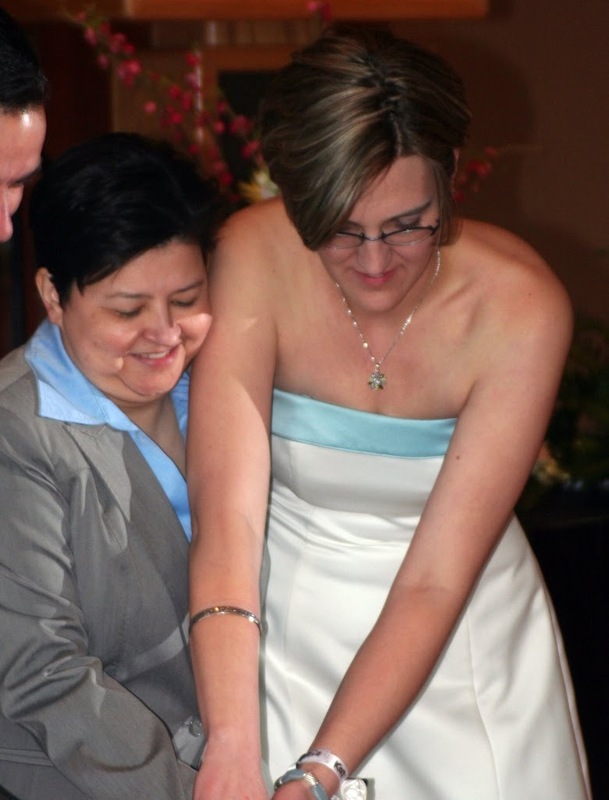 The drive out was a mad dash to arrive in time for the ceremony without having to leave home at dawn. Driving along the interstate at 80 miles an hour, most of the view was a blur of mountains and trees, with occasional valley views of pretty dairy farms with silos and big red barns. I’d imagine it to be gorgeous in the fall. Parking problems caused both Susan and I to miss the ceremony, despite having arrived within plenty of time. Once the ceremony started, no one was allowed in, even though I begged and pleaded that I’d driven for 5 hours. Bummer! 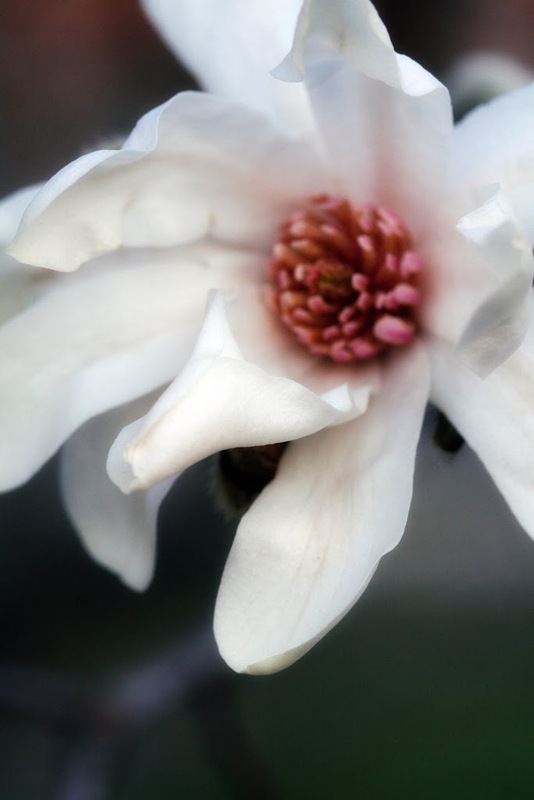 I watch the Star Magnolia in the front garden for a sign that it’s ready to burst and become magical. It’s pretty enough in the winter; the bare gray branches make some interesting shadows across the sunporch when the light is right. For most of the year it’s just a big green bush; overshadowed and outprettied by the American Holly beside it. In early spring, with everything else shouting yellow, is when I fall in love with it. There’s something breathtaking about rounding the corner to home and seeing first this haze of white flowers. The show doesn’t last for long and the flowers often are marred by rain or freezing temps, but it’s beautiful however short-lived. Spring is slowly ambling its way through the garden here; forsythia and daffs are blooming, the quince is in bud and just Wednesday I found the purplish tips of Virginia Bluebells and Bleeding Hear ts forcing their way out of the dark in Cricket’s Garden. Peepers are peeping and Phoebes are back, as is one of the local pair of Osprey, spotted just today on its cell tower nest by the train station. It’s curious to me the way spring signs seem so long in coming, yet when they do come, the progression is so predictable and welcome and right. The world is opening up again. It sounded simple. So deceptively simple that I should’ve known it would turn nightmarish. We’d finally decided to spend the money to have central air put in the house. A couple thousand dollars, a couple holes in the ceilings for vents, duct work in the attic, the husband off from work for a couple days to supervise the AC guys. Simple. That last bit was the dangerous part. While the husband was home to supervise, I was off chasing birds, and no one was here to supervise the husband. A husband with lots of time on his hands. Idle hands. Hands that have been itching for years to get their muscle into remodeling the bathroom. The one bathroom. The only bathroom in this little house. Aside from my almost total inability to make decisions concerning anything as important as paint color and tile dimensions and faucet finishes, there was the stumbling block of this being the only bathroom in our house. That one in the picture up there, all torn apart. How do you manage a bathroom remodel while continuing to live there? We hadn’t figured that out and I thereby had the perfect excuse to continue to postpone any horrid decorating decisions. Right. So everything seemed fine here when I got in from work at the end of day one of the AC installation. There was lots of banging and dust and strange men roaming about the place, but fine nevertheless. Then I went away to chase birds. There were periodic updates from the husband. The first inkling of a problem was the report of a crack in the dining room ceiling and vague mention of a leak *somewhere in the bathroom* discovered via a puddle on the workbench in the basement below. My panic was assuaged by assurances that it was a quick fix – a seal on the toilet – nothing complicated. The quick fix turned into a need to replace parts of the subfloor damaged by said leak. The next phone call had me picking out vanities from memory. 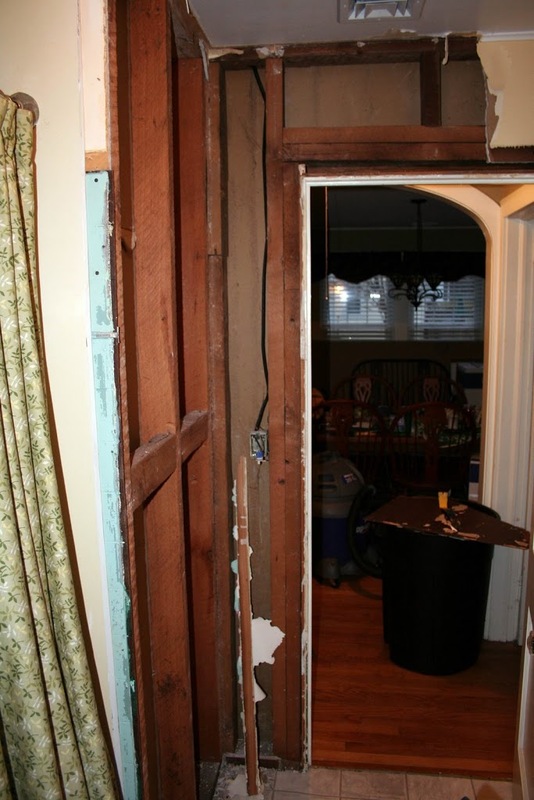 See… there was another leak, in the wall, behind the sink… so we’ll have to tear the wall down to fix the leak. And while the wall’s down, we might as well replace the vanity, right? Months ago we had walked through that aisle in Home Depot. And could I remember which one I liked? At this point I wasn’t sure what I was more panicked about: the bathroom being torn apart or my husband making decorating decisions on his own. I got in yesterday to find a new bathtub in my driveway and sheetrock in my living room. As I write, the husband is tearing down walls and cursing and mumbling about replacing a windowsill. Luka is having a ball, snarfing up bits of fallen wall and the odd nail. And I’m wondering where I’ll shower for work in the morning. But hey… the AC went in without a hitch. The American Museum of Natural History was also featuring a temporary tropical butterfly conservatory that I really was interested in seeing. I was hoping for a small dose of warmth and flowers and butterflies. Outside the vivarium were a few collections of mounted specimens; also dead, but much prettier than those I told you about the other day. Something about seeing those bunnies pinned up that way really creeped me out. The butterflies didn’t bother me though. I have no idea what any of the ones in this first pic are; the orange-ish one on the right looks like some variety of anglewing, but who knows? I don’t remember these being labeled, even. These look much more familiar – and of course, they’re labeled! The vivarium was kinda neat – smallish, but with lots of free-flying butterflies and moths. The space is kept at 80 degrees or so and at least 100% humidity, so with my sweater and wool coat I was fairly uncomfortable after 2 minutes or so. I would have liked to see a nicer variety of flowers, there were only pentas that I remember, plus lots of greenery. The butterflies have feeding stations similar to hummingbird feeders, plus there’s fresh fruit available to those species which prefer their food au natural. The light was harsh for photographs and it seemed like the prettiest butterflies never stayed still for a photo, but this guy finally settled in. I think he’s called a Cairn’s Birdwing and is from Australia – the topside of his wings is the most striking shade of neon green – I found a pic here to give you an idea, since it was impossible for me to get a pic while he was fluttering about. I have no clue what this one is? Lovely eyespots, though. There were quite a few similar to this, with larger or more eyespots; wish I could remember what they’re called. 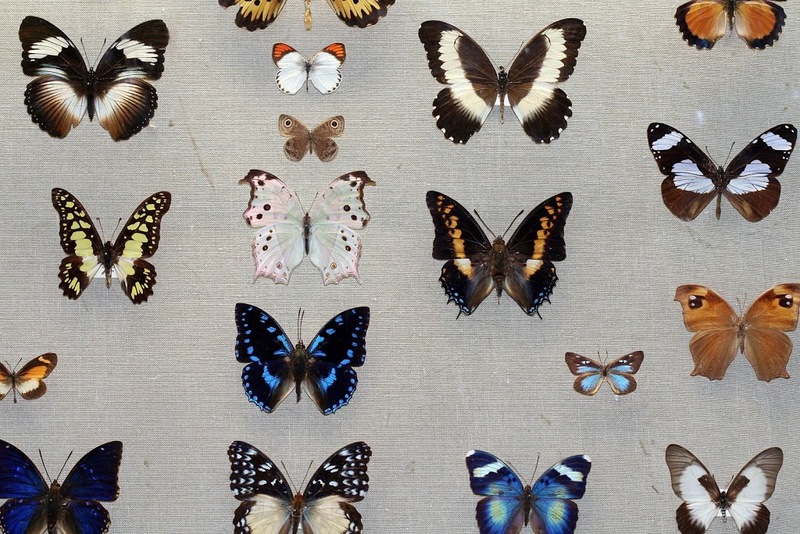 I’ve heard that the buterfly garden and conservatory at the Bronx Zoo is really great – anyone been there? This was a nice antidote to the cold of the first few days of spring, but left me wanting more. 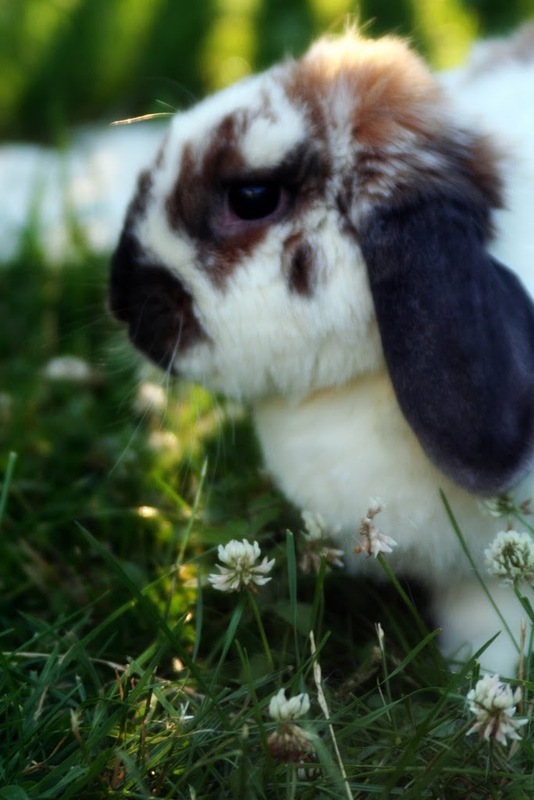 Freckles, this year’s appointed Easter Bunny, hopes your basket was filled to the brim with joy and love. I had occasion to visit the American Museum of Natural History in NYC today. I almost never go to the city, certainly not without kicking and screaming about it, but I’ve always wanted to see the museum so happily took the opportunity today. The place was packed solid with visitors, it being a holiday weekend, so with limited time and limited patience for crowds I focused my wanderings in the birdy parts of the museum. I don’t have any other natural history museum experience to compare it with, but my overall impression was sort of lackluster. 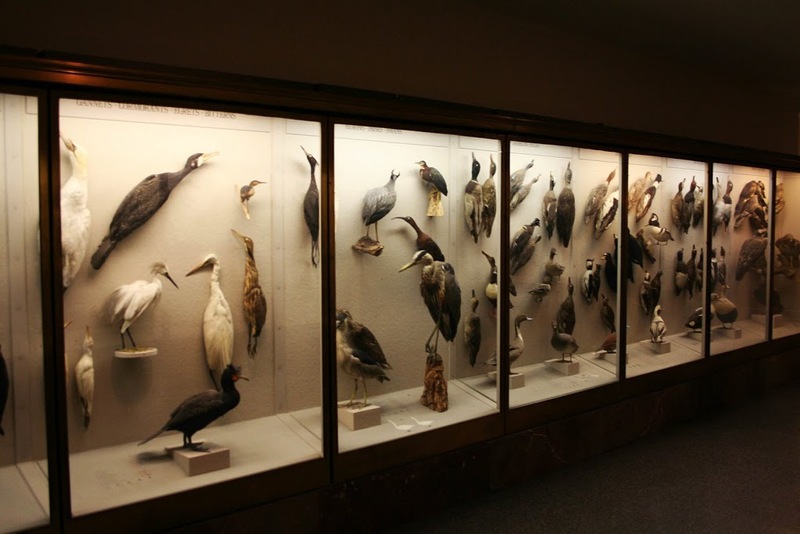 There are several halls dedicated to birds, be it local to NYC, North American Birds (which holds 99% of all known species), or Birds of the World. The exhibits were very dark and the bird specimens in poor condition and really very creepy-looking! I don’t think this hall of dead birds will be winning us any converts to birdwatching anytime soon. Yuck. Equally icky was the hall of dead rodents and rabbits; it was vaguely interesting to be able to make size comparisons among the different species of hares and rabbits, but still… yuck! What did impress me were the habitat dioramas; these also included mounted specimens, but they were presented in somewhat more life-like scenes. Each was backed by beautiful and colorful paintings and included model plants and flowers to mimic the natural habitat of each species. I’ll share just a few pics of my favorites… and do click on these! Birds of the shore… feels like home on a summer day. 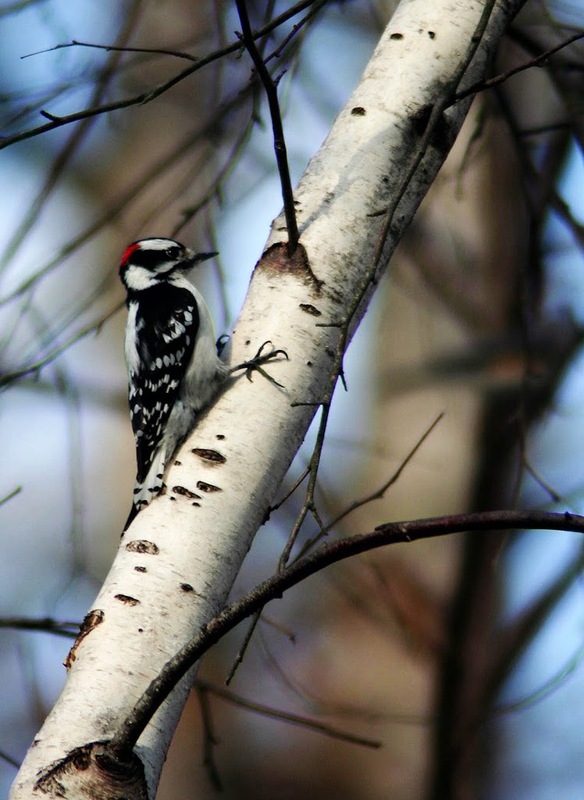 Have you noticed the woodpeckers lately? All at once they seem to have decided to stop being so shy and are swooping from tree to tree in their woodpeckery way, testing out the hollow limbs to find the most resonant. The downies love peanuts and always seem to be at the feeder or waiting nearby in the little dogwood tree for the chance to sneak in and steal away a nut. Sweet little birds! Spring was born today… I hope you found a minute to get out and enjoy it! I tried to, but it was as blustery and cloudy as mid-February and the extent of my fresh air for the day was standing around outside the carwash during my lunch hour. 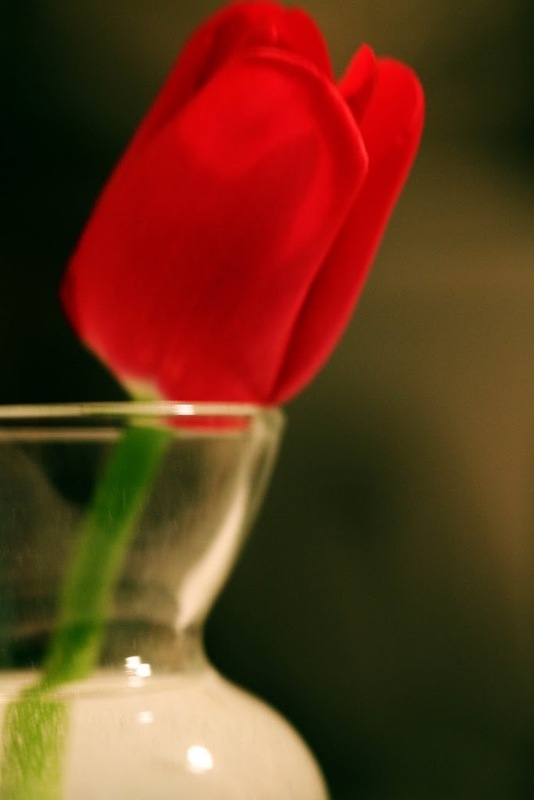 More grocery store tulips… red this time. Luka was back to the vet after his neuter for a suture check – what a train wreck that dog is! Peed all over the handsome vet’s shoes… fussed and embarassed me.. at least everyone knows to expect it from a Lab. I’ve decided he needs a hobby (other than pestering me!) so I’m thinking of sending him to doggy day care at least one day a week for some more exercise. That’ll be easier, of course, once the weather improves, but still I think some time away from home may improve our relationship some. Last weekend I started to amass a little collection – for a photo shoot – of the things that I yank from Luka’s mouth in a typical day. There were wads of toilet paper (more often it’s the whole roll), assorted bunny toys and strands of hay (he thinks he’s a goat, I swear! – but it helps with the vacuuming), a couple charcoal briquettes. I stopped, though, when my husband told me he had eaten (EATEN!) two nails dropped when he was fixing the aluminum siding on the house. What dog eats nails without requiring a trip to the vet? Unbelievable. He’s ninety pounds now, so you can imagine the challenge in making him do anything he doesn’t mean to do. I’d given up on the training harness and the prong collar and decided to go instead with the old standyby promise headcollar for tonight’s trip to the vet. Luka will walk okay on a lead for our regular walks, but a trip to the vet is something else, you know. I’d forgotten how hard it is for a dog to get used to one of those, nevermind a dog as mouthy as Luka! He was doing the alligator death-roll for most of the time at the vet – when he wasn’t peeing on someone’s shoes – remind me how long it’ll be before he’s civilized, please? They left in the autumn of the year, a great army of legend. Flags flashed rusty red and steel grey, barred and banded. Old veterans did heed the call once again, their ranks, as with all armies, swollen with so many young. By battalions they paraded across the countryside and coastline, leaving summer behind to seek their fortunes elsewhere. Their passage was witnessed by countless numbers at Cape May or Hawk Mountain. The thrill of the parade tempered only by thoughts of how many might never return. Then they were gone. Yes… some stayed behind; a rear guard to watch the homefront. Others, Northern Warriors, on their own epic passage, filled the void left by the other’s passing. Even with these, the world seemed barren, without magic or myth. Through the long winter how often our thoughts have drifted to how the warriors are fairing. Have they found solace in lands more plentiful? Were their enemies too strong? How many will return well or battle-scarred or not at all? Now the first breaths of spring stir the air. Though the land still sleeps, the promise is heard in whispers… changes so subtle as to go unnoticed. The distant regiments hear those whispers. It is time once again to reclaim their birthright, their territory, their home. Those who would witness their return climb to the mountaintops (or find a local spot close to home!) and wonder at the adventures they have known. Look to the skies and cheer the battalions on their return. 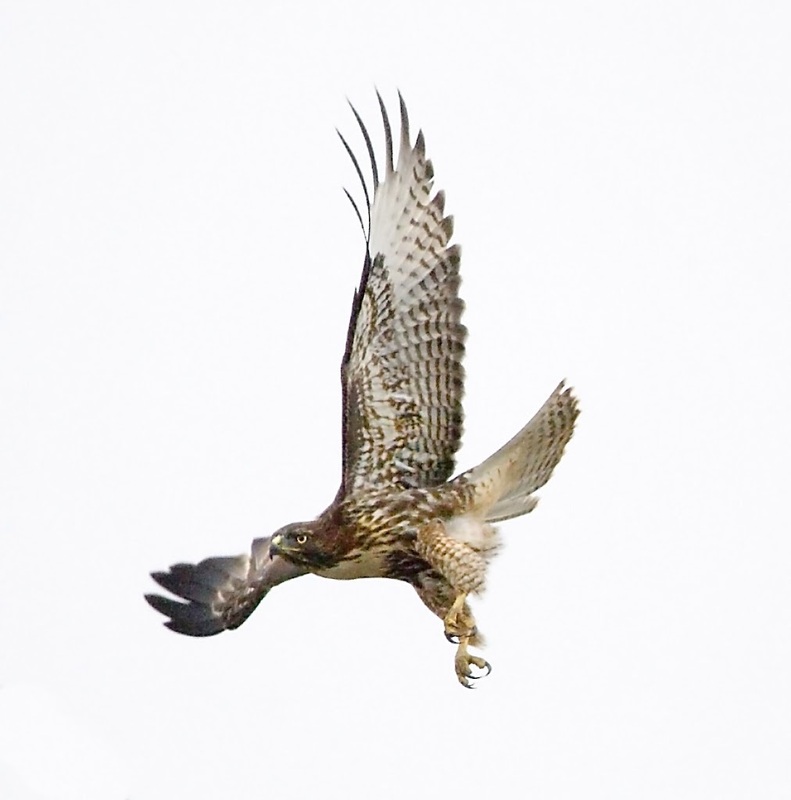 Look to the skies… the hawks are returning! 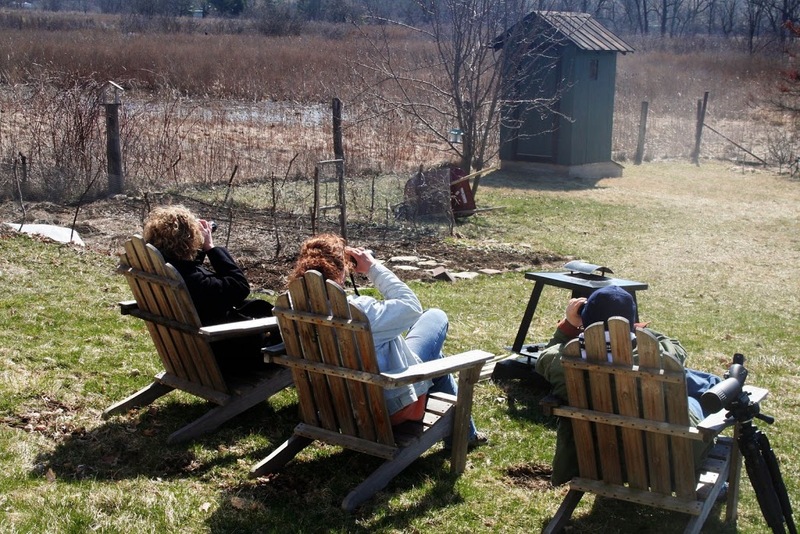 The Sandy Hook Migration Watch started March 15th! Red-shoulders are moving – I’ve even seen a few! There’ll be Broad-wings! Come! Bring cookies for the counter!